In past years, 4G mobile routers with SIM card slot are becoming more and more well-known because they are of small size and can be easily taken in a handbag or in a pocket. Nowadays, more and more people would prefer the 4G router with Ethernet port, which would provide one more option for internet connection. What’s the most, the manufacturers typically set up the 4G routers with Ethernet with large battery pack, which makes the device more expensive. Huawei is the first manufacturer to release its 4G mobile router with Ethernet port, and now the Netgear follows. Huawei E5885 is the latest 4G mobile hotspot with Ethernet and Netgear presents the Nighthawk M1 as its first 4G router with Ethernet. Someone may ask: what’s the difference between Huawei E5885 and Nighthawk M1? Which one is better? You may find the answers after reading this article. Actually, before the Huawei E5885 was presented, Huawei had released a few mobile hotspots with Ethernet port such as E5151, E5730, E5351, E5770, E5771, which are a series of mobile routers with Ethernet. It has been proved this series of MiFi hotspots are very popular in the end-users. Now the upgraded Huawei E5885 is available with more advanced features and cool design. On the front of E5885, the upper part is LED screen while the lower part is leather material with Huawei logo. The touch feels much better than the predecessor models. And it’s much thicker than the mobile hotspot E5770 and E5771. The power button, WPS, and the Interfaces are located on the top edge of the body. The Ethernet port and USB ports are covered by a square cap, which you have to open to see. The back cover could be removed, however, like the Huawei E5786, the battery is built-in and non-changeable. The Mirco SIM card slot and SD slot are available with the reset button. Unlike its predecessor of Netgear mobile router, Nighthawk M1 also has a thick body. On the front, there is a round screen, like E5885, it’s also not a touchscreen. There are battery and data transmission indicators around the screen. The Netgear logo and carrier logo are on the side of the screen. The power button is on the top and the Ethernet & USB ports are located on the opposite side. 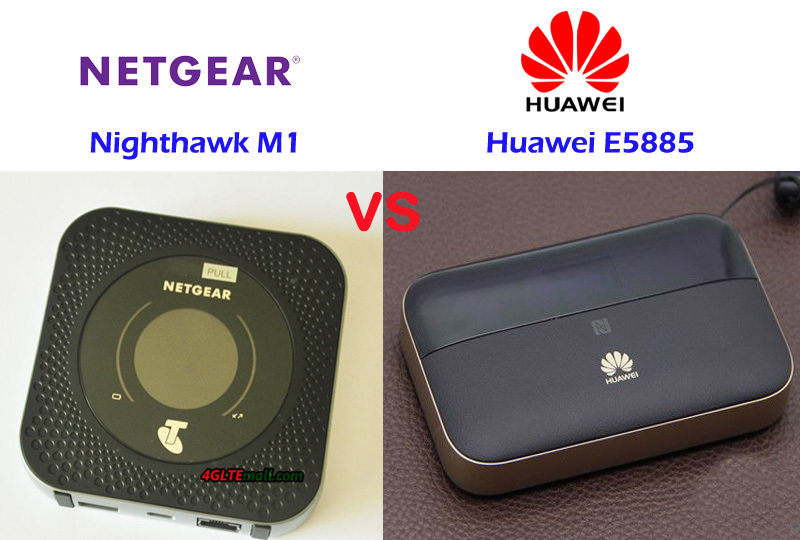 The difference is Netgear Nighthawk M1 has two connectors for external antenna, which is missing in Huawei E5885. And the USB ports for Nighthawk M1 and the Huawei E5885 are different. 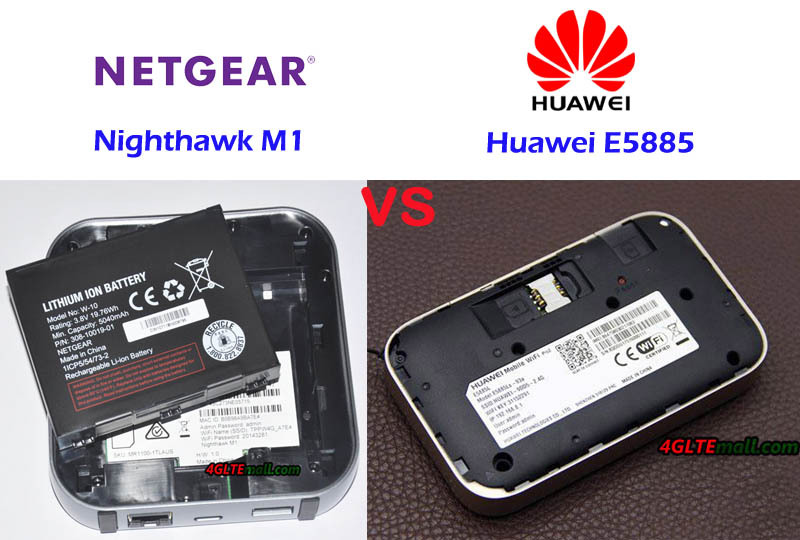 The Nighthawk M1 back cover could be removed and unlike Huawei E5885, the battery could also be removed for exchange. The Netgear M1 also uses Micro SIM card size, but no slot for SD card. From the specs, we can see the Nighthawk M1 Router is more advanced with the support of LTE Cat.16, which could achieve speeds up to 1Gigabit / s and upload speed to 100Mbps. The speed is much faster than that of Huawei E5885. The LTE Advanced Pro technologies would provide amazing surfing experience. The Nighthawk M1 variant models could be used globally after unlocking. However, there may be a limitation due to network incompatibility. The Huawei E5885LS-93a seems to be more open for global travel. It covers the main frequency bands in all areas. The Nighthawk M1 could support up to 20 users while Huawei E5885 mobile hotspot supports up to 32 users. The Ethernet port in Huawei E5885 is for WAN and LAN but the port in Netgear M1 is only for LAN, which may not be expected for Ethernet. 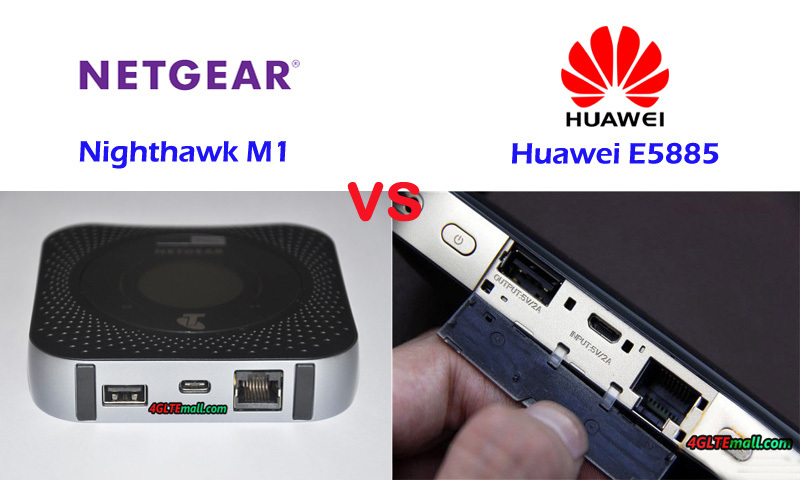 The Huawei E5885 has a large battery capacity of 6400mAh while Netgear MR100 has around 5040 mAh battery; However, the removable battery of Nighthawk M1 seems better than Huawei E5885 built-in battery. 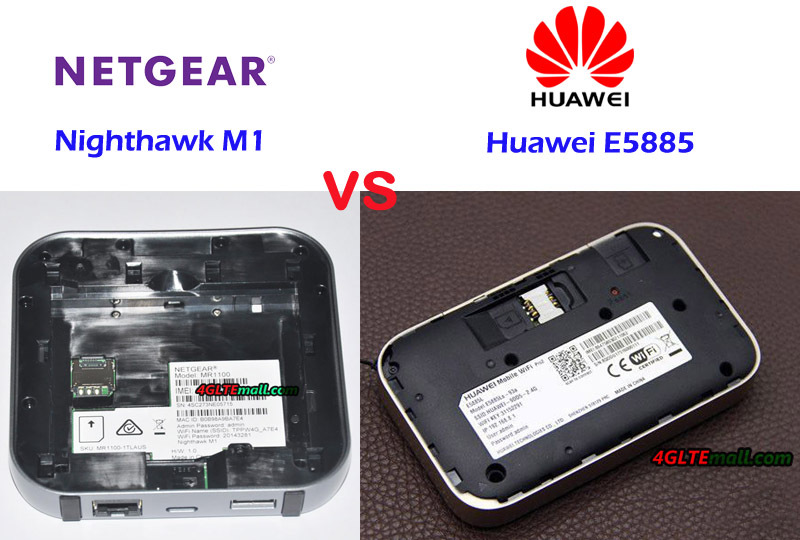 The lack of an antenna connector in Huawei E5885 is also criticized while the Netgear M1 has two connectors for external 4G antennas, which is very useful when using the device in weak signal areas. Per the feedback from the users of Nighthawk M1, it’s the best 4G router with Ethernet. However, the advanced Nighthawk M1 is more expensive, so if you would buy Nighthawk M1, the price is an important concern.